The swim route will begin from Jumeirah public beach, one of the region’s most infamous destination beaches and a getaway for travellers from the East and West. Cycling route gets away from the city and into the challenges of the Arabian Dunes. A 45km flat back and forth can prove to be the fastest course if winds were friends and not foes. The scenes of the natural Arabian Desert were previously seen on TV globally through the annual Tour of Dubai. Dubai recently completed a jogging trail along the Jumeira Beach to be used by the public throughout the year. 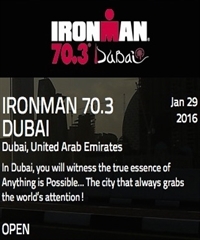 IRONMAN 70.3 Dubai run route will go through 3 laps of 7km each in a very spectator friendly packed beach. The crowd is promising to cheer for participants through the 21.1 run before finishing right where the start and transition area is, next a general grand stand.